Her G37 hit 100k and we needed something with a little more space with teh littel babeh. So we traveled 500 miles round trip to get it. Only pic I could find. Maybe there will be more tomorrow. It's nice. 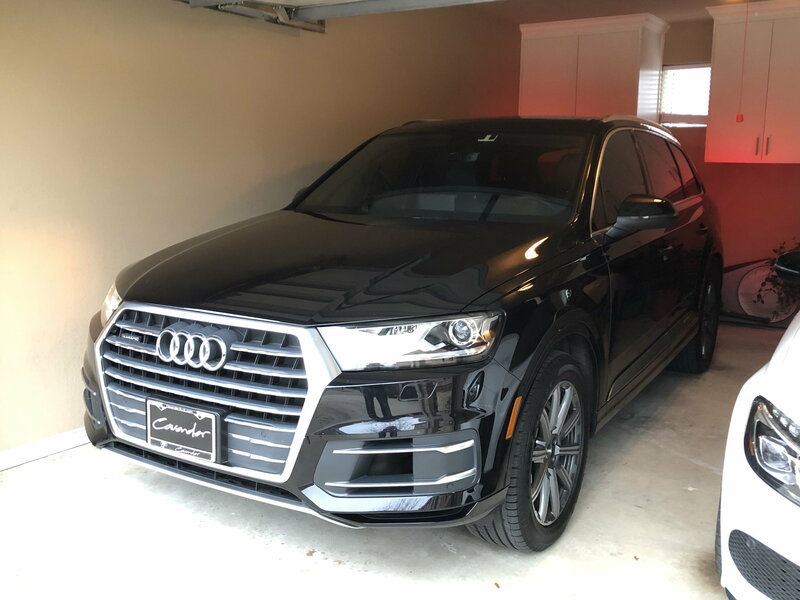 2018 Audi Q7 3.0T. She loves it. And I must admit I do too. Very nice, smooth drive, but has power when you need it. Very nice, comfy interior. We've actually been looking for one for about a year now. Recently found one 250 miles away.. 2018.. super low miles (was a dealer loaner)... at a great price... with the exact options we wanted, so made a road trip this weekend to get it. Wife is happy, I'm happy.. other than the new monthly payments . So weird and different driving so high up, but again.. we both love it so far. Sorry, I do not think she will approve of putting waffles, bacon and butter on it. Also, that fker is 'uuuge'. So much bigger than her G37 (obviously). We had to clean out the garage to make it fit lol. Last edited by imj0257; 01-13-2019 at 05:54 PM. They're just so much better if you can afford the payments. And repairs if kept past warranty. They're not big fat cars for old people. I consider Honda and Acura the VW and Audi of Japan! Benz and BMWs are for people who don't know what reliability is, or for people who don't care or came from a Lexus or something. Audi and Acura hold a closer prestige, IMO. Lexus, BMW and Benz compete to one another more. Having sat in a few Audi's and drivin a VW CC, I didn't feel very out of place as a Hondacura guy. Both cars have a simple, clean, sporty and nimble feel to them. But the Audi is German, so there's the benefit of that too, plus, I hear reliability is way up. The VW drove pretty well, almost like new given 180K on the clock, believe it or not. Last edited by Midnight Mystery; 01-13-2019 at 07:18 PM. I think you can simply chalk it up to Audi being on a hot streak in terms of exterior and interior design since about 2009. Had BMWs since 1990. Never had an issue. More like people don't know how to properly maintain older ones or can't afford to service new ones. Meanwhile, Audi just barely above industry average and Acura worse than Mercedes. I've heard otherwise. I think all of these cars will be fine mechanically, it's the electronics I'd worry about. Electronic issues plague basically every German brand, minus Porsche. It's a result of having so many powered luxury goodies. Regarding industry averages, I'm going by the usual Dependability Study which puts Lexus at the top naturally, BMW, Audi, Industry Average, Mercedes, Acura. I still own my '07 TL-S from new and it's been a great car, all 160,000 miles. I have no regrets refusing offers to trade in from both Acura dealers here; the brand just seems lost in styling, don't know if the cars are any fun to drive, and sad to see Acura marked as reliable as Jaguar whilst Honda sits above the industry average. Reliability used to be a strong point for Acura. We know the platform and power trains are shared among Honda and Acura. I'm curious what the reliability gap is derived from. Congrats on the new ride. Those are great looking. I knew ahead of time cause I remembered you mentioning it JT4 new car thread. Was coming to post a picture but you already had. Congrats! I'm a huge fan of the newer Audis. Congrats, I'm so glad you got it.... I told you that you were going to be surprised about how easily it gets up and goes... I haven't driven ours in a week but drove it yesterday and every time I do I say two things (I swear I'm not joking) to my wife. I can't believe how agile this truck is, and I LOVE THIS THING! After the 3rd gen TL, I thought Acura completely lost its styling... everything was so ugly. Plus, they weren't fun to drive. Acura went the 'electronics tech' way instead of focusing on styling or being a driver's car. Looks like a nice driver. My wife is starting to get the itch to replace the Flex (which is closing on 100k), and has her eye on a GLC. IE: Bottom right of imj's photo. See it now! How is it, imj0? Perfect mix of luxury and performance and even gas mileage to be a great daily driver. Last edited by imj0257; 01-14-2019 at 09:07 PM. If I were you I'd STFU! I have been around a lot longer than you on here. I know how far I can poke TWIG before he goes off. The fact that you are implying my conduct and Saintor is even remotely similar is beyond laughable. You didn’t buy an Audi. I think that covers it.